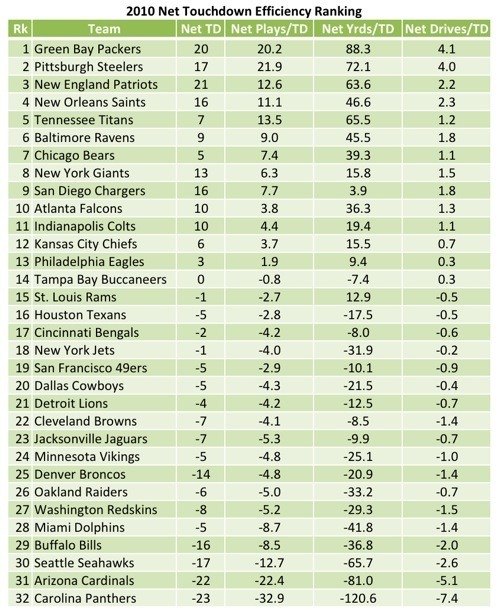 On Wednesday, we ranked NFL offenses according to their touchdown efficiency per plays, yards and drives. Eliminating field goals and calculating rankings based on efficiency rather than raw scores helped isolate the best and worst offenses. So for the next step, we'll throw defense. I added up touchdowns allowed by each defense and figured out the same efficiency stats as Wednesdat. Then, simple enough, I subtracted defense from offense. Positive scores indicate better teams. For example, the New England Patriots make their opponents go 13 extra plays, 64 extra yards and two extra drives to get a touchdown. They are ranked third overall. First and second, by a solid margin, go to the two Super Bowl teams. They were 1-2 in every category and outpaced the third place teams significantly in Net Plays per TD and Net Drives per TD. Predictive stats are often too reductive, but if you used this measurement to pick the Super Bowl teams at the end of the regular season - it would have guided you well. The Eagles, despite their highly ranked offense, come out only 13th in the net rankings. If you didn't figure it out already, Sean McDermott's defense was a huge liability in 2010. Also note that while we've eliminated some biases, the stat doesn't account for strength of schedule. Not sure how much that would change things, but keep it in mind nonetheless.